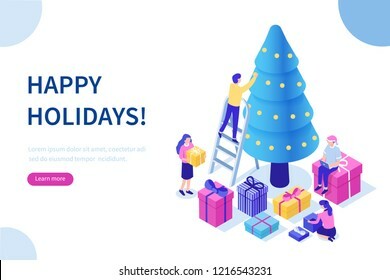 1093 place | Vector illustration in rank M-rank: Happy business people decorate Christmas tree and prepare gift boxes together. Can use for web banner, infographics, hero images. Flat isometric vector illustration isolated on white background. Happy business people decorate Christmas tree and prepare gift boxes together. Can use for web banner, infographics, hero images. Flat isometric vector illustration isolated on white background.